H. Marshall Claybourn began flying in 1941. He hitch-hiked back and forth from his home town of Palacios, Texas, 110 miles to Houston to learn how to fly in a new 65-horsepower J-3 Cub. In 1949 he became a helicopter pilot and came to Fort Worth, where he began working for Bell as a flight-test engineer. He had been a mechanical engineer after graduation from the University of Houston and, while he was in college, he did charter executive flying. He worked six years for Bell Helicopter in design, flying, and factory work. Then he went down to Mississippi State, where he earned a master's degree in mechanical engineering under the instruction of the famous Hall of Famer Gus Raspet. Between 1959 and 1964 he worked for Cessna as an aerodynamicist and engineering test pilot. This was followed by three years with the FAA, where he flew and served as instructor in Oklahoma City. He worked in 1967 and 1968 on flight-test theory and technique, then worked some as an engineering consultant before being hired by a prospective client to work for Swearingen Aircraft as an engineering test pilot. Marshall got into soaring in 1951 when he joined the Texas Soaring Association and learned to fly with people like E.J. Reeves and Jon Carsey. He soloed in 1952. Later he was the founder and first president of the Kansas Soaring Association and wrote its newsletter for five years. In November 1960, the Soaring Society of America invited the Kansas Soaring Association to host the Nationals. Since the club was only six months old, it declined the invitation. Then the Chamber of Commerce of Wichita offered financial assistance and asked the club to do it to help Wichita celebrate its centennial. The Kansas Soaring Association accepted the bid. Those in attendance were very pleased with the organization and work which had gone into the contest, although the meet suffered from bad luck on its weather. 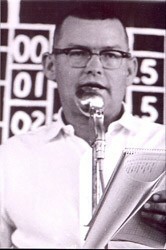 That year Marshall Claybourn was the contest director. In '62, '63, '65, '66, '67, and '69 he served as the Nationals competition director, the same post he was scheduled to hold down at the 1970 Internationals at Marfa; while in 1968 he captained the U.S. International Soaring Team's highly successful showing in Poland. A long-time SSA Director, Marshall was also a vice president of the Society and one of the three members of the SSA Executive Committee. "I'm attracted to soaring by the type of people it attracts, people of broad interests, very unique people. For the young, it teaches them to work together - you can't launch a glider alone. But it doesn't destroy individuality. When a pilot is off on his own, the decisions are his. People who want to ride with the herd and have someone else make their decisions for them don't stay around soaring very long." Marshall Claybourn has the soft speech of Texas. In running pilots' meetings he is quiet, competent, precise, and knowledgeable. He has enough of the drill sergeant in him to keep things moving and to keep delays from starting. The second or third day of the contest, one pilot was given the radio hog award. "If you win that three times, we cut your antenna," Claybourn told him. The pilot stood up to explain. He was not recognized. He finally climbed up on the podium to make a speech. He was not observed. Nobody else tried to interrupt a pilots' meeting. "Marshall Claybourn in the soaring business is an unusual man. Of course, most people who have ever been around soaring meets know that - because he devotes more time and energy and expert knowledge to running these contests than anyone expects a man to do on his own time. As we all know, officials are not paid for these things. "It's not just that as competition director Marshall spends 10 or 12 days of his time; he has a volume of correspondence the year around, and that is especially true with the Internationals coming up. He's going to be competition director for that contest, and I'm slated to help him. "He has a very quick, analytical mind for what he is doing, and his job would be conditioned to that. He's got a good facility for talking to a crowd and answering questions without hesitation. He gets to the point." Marshall flew his 1-26, built from a kit, for Diamond altitude and goal. It was one of his ambitions to be one of the few pilots to complete the full Diamond badge in a 1-26. He came within a few miles of Diamond distance on several of his 1-26 flights. He was awarded the Eaton Trophy in 1969 and the Exceptional Service Award in 1967 and holds Silver Badge #212 (1954), Gold #51 (1956) and Symons One Lennie #55. Ed Note - Marshall's generosity is evident by loaning his 1-26 to this reporter for a fun soaring flight at Marfa.